Additive manufacturing is reshaping the manufacturing industry in a sustainable approach. Apart from eliminating design constraints, lowering material wastage or literally building almost anything, it positively impacts various industries even remotely associated with manufacturing. The number of industries it has influenced continues to grow and the entire manufacturing spectrum is benefitting immensely from its potential. Additive manufacturing is surprisingly also contributing to the restructuring of supply chains across the manufacturing industry with its disruptive potential. Traditional supply chains face a lot of challenges but have survived the test of times due to incremental innovations. With additive manufacturing, supply chains seek a revival and strong revitalisation. Below, we try to understand how additive manufacturing is shaping the traditional supply chains and is rewriting the decade’s old industry. Additive manufacturing was invented in the 1980’s, but it was restricted to the manufacturing industry till the early 2000’s. During this time, the patents acquired by big companies started to expire and people started experimenting giving a rise to a revolution. From then, in a short span of time, it has developed into an accessible democratic technology serving people from within and outside the manufacturing industry. Any new technology is welcomed with skepticism first and once the initial resistance wears out, the technology normalises. Additive manufacturing too faced the same situation. Still today a lot of new industries are trying to learn and understand the full potential of additive manufacturing and how it can enhance the industry. International conferences are held and additive manufacturing is discussed at detailed lengths. Separate events for dental applications, AM materials, hackathons, etc. are organised where the power and scope of additive manufacturing are explained and displayed so as to encourage industries to adopt the technology. A number of companies are incorporating the additive manufacturing technology in their workflow and the positive impact is prompting competitors to adopt the technology. Global companies like Boeing, Airbus, Adidas, New Balance, GE, etc. have already adopted additive manufacturing in their workflow and aim to exploit its full potential in the coming years. Many of these new adopters have even launched a new product line by using AM. Adidas is one of the most well-known proponents of 3D printing and it recently launched its 3D printed shoe-line called ‘Futurecraft 4D’. Simply stated Supply chain is the movement of raw material, work-in-progress and finished goods from the point of origin to the point of consumption. 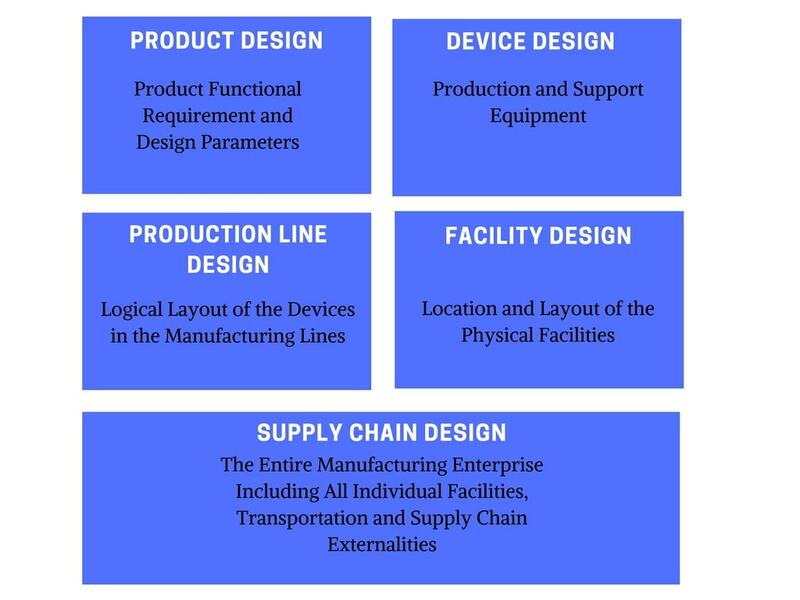 It is a network of inter-connected activities like product development, sourcing, manufacturing, and logistics as well as the concerned information systems aimed at maximising the value of the product. The traditional supply chains worked on the Push based distribution strategy where the manufacturers simply produced goods and pushed it through their supply lines without any specific feedback loop. This often created excess wastage of goods and the cascading effect would be heavy. The new supply chain models depend on a pull-based distribution strategy where the customer demand pulls the goods through the supply lines and helps in a streamlining of the supply chains. This reduced the distribution problems and reduced wastage of goods, manpower, and storage. But even the new supply chain model fails to analyse or predict the accurate requirement of a customer. The demography and geography of the customer and reliability of the product play a critical role in affecting the demand-supply balance and the whole system continues to run on inefficiencies. The most significant benefit additive manufacturing provides is On-Demand manufacturing. On-Demand manufacturing is a new process of manufacturing wherein the goods are manufactured as and when they are required by the customer and not before-hand as in the case of traditional manufacturing methods. Traditional manufacturing techniques require the product to be mass manufactured in sufficient quantities and store them in warehouses so the customers can be catered as and when he paces an order. This entails additional costs of storage and manufacturing even before an actual sale. So this not only blocks investment even before a sale is made, but also the quantity has to be accurately predicted otherwise the inventory piles up leading to increased cost of resources. On-demand manufacturing eliminates these issues by manufacturing goods right when the customer demands. Additive manufacturing allows such flexibility in manufacturing at a low cost. 1. Product Design: AM enables manufacturing of lightweight products with complex designs and functionalities. It can reduce the number of parts by incorporating them together in a single design. However, currently, it has limited number & type of materials available for manufacturing. 2. Device Design: This considers the design of the printer itself and how it can affect the usage of supporting equipment’s required for traditional manufacturing. 3. Production Line Design: This concerns the appropriation of resources like materials and automation of processes with how the AM system will be incorporated into the workflow. 4. Facility Design: Additive manufacturing systems allow for significant benefits in terms of energy consumption, the requirement of less number of jigs & fixtures, less equipment, and tooling costs, fewer movement costs, fewer and less-skilled operators and lower levels of inventory. 5. 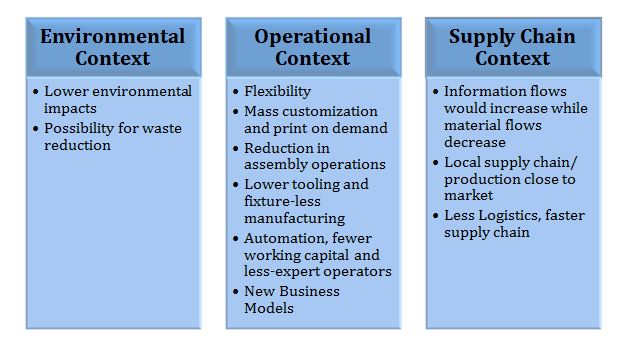 Supply Chain Design: This offers benefits like building new business models like selling digital files instead of physical products, a new industry of production of AM equipment, mass customisation, on-demand manufacturing, shorter lead time, product postponement, using logistic networks for setting up distribution centres which are closer to the customer. The above principles define the design of supply chains and how additive manufacturing can positively affect it to build a new era of collaborative functionality where AM influences supply chains to improve its overall efficiency. Automation, fewer working capital, and less-expert operators: AM process significantly reduces the manual intervention during the manufacturing stage. This requires fewer and less-skilled operators. Local supply chain/ production close to market: AM will help in shortening the supply chains and reducing the inventory stock through its close proximity to market and its ability to shorten lead times. By now, the world has accepted the fact that even though 3D printing offers tremendous revolutionary benefits AM, as of now, cannot completely replace the traditional manufacturing. Both the additive and traditional manufacturing, individually, offer benefits which cannot be replaced by the other. Both these technologies can leverage each other’s potential and create a new workflow to benefit the world of manufacturing. The future of 3D printing seems bright and it is bound to develop new business models and technology collaborations which will move towards sustainable manufacturing processes. 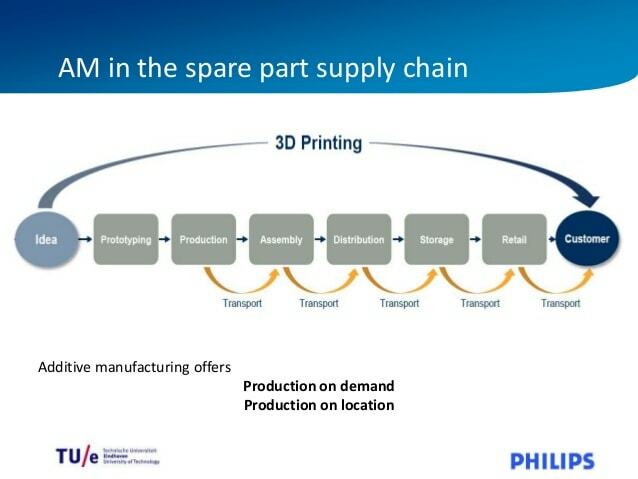 Let’s have a look at the five possible future business models for 3D printing in creating efficient supply chains. A company keeps its digital design files in a secure storage and when a customer places an order for a specific part, the local 3D printer will print that digital file and deliver the part. This can prove highly beneficial for rare, antique & obsolete parts. In such a system, instead of dealing with multiple suppliers and deliveries, logistics providers can take care of sourcing of materials as well as 3D printing activities and then quickly deliver the parts safely on the same day. The postponement is a business strategy wherein investment is made in the product or service only at the last moment. This helps in maximising possible benefits and minimising the risk. By delaying the investment in the product/service, the capital can be saved till the last moment and utilised elsewhere while it minimises the risk which can result from cancelled orders. The principle of On-demand spare parts management can be applied to achieve similar on-time manufacturing and delivery. Adidas is experimenting with such a model where it aims to open speed factories which will operate 3D printer and automation technologies to create customised shoes at local factories closer to the final delivery destination. 3D printing allows comparative ease of operation and can be easily incorporated into this system. Supply chain can help leverage this same model by installing 3D printing systems at their pickup locations across the city. 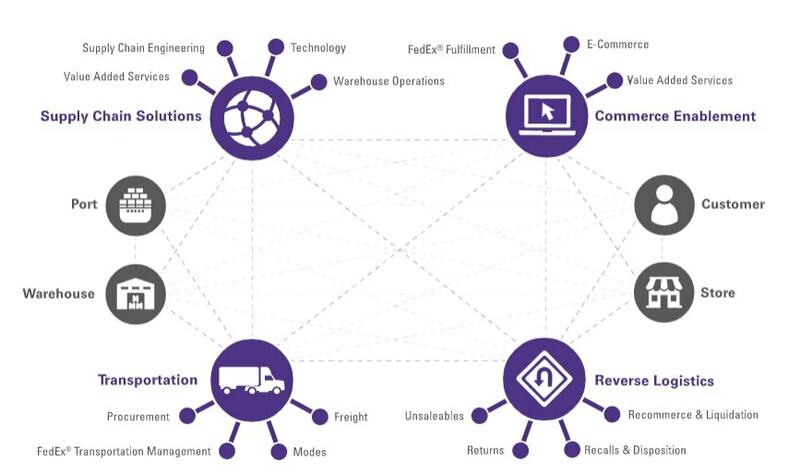 As logistics partners already have the ready infrastructure for the deliveries, the dense network can easily be leveraged. Companies have understood the importance of incorporating additive manufacturing into their workflow for improving efficiency, reducing wastes, environment-friendly operations, greater customisation and localised manufacturing and hyper-fast deliveries. As days go by, more and more companies will realise the potential of additive manufacturing and start adopting the system as a way to strengthen their global reach and presence. The new business models are promising and potential to grow is tremendous. Buoyed by this view, the 3D printing revolution will continue to grow and will only become stronger every day. DHL in its assessment of the future of supply chains states that “3D printing is likely to complement rather than entirely substitute traditional manufacturing techniques. Simply put, not all products can and should be 3D printed. This conclusion is echoed in a recent survey which revealed that 38% of companies anticipate using 3D printing in their serial production within five years but not necessarily to completely replace traditional manufacturing” . 2. Campbell, T. A. and Ivanova, O.S. (2013). “Additive Nabufacturing as Disruptive Technology: Implications of Three-Dimensional Printing,” Technol. Innov., vol. 15, no. 1, pp. 67–79. 3. Dzhenzhera, G. (2013). “Additive manufacturing: opportunities and constraints c1 Additive manufacturing: opportunities and constraints. 4. Spahi, S. S. (2008). Optimizing the Level of Customization for Products in Mass Customization Systems., p. 219. 5. Gibson, I., et al. (2009) Additive Manufacturing Technologies: Rapid Prototyping to Direct Digital Manufacturing. Springer Science & Business Media, p. 484. 6. Zhou, C et al. (2011) “Development of a multi-material mask-imageprojection-based stereolithography for the fabrication of digital materials BT – 22nd Annual International Solid Freeform Fabrication Symposium – An Additive Manufacturing Conference, SFF 2011, August 8, 2011, pp. 65 80. 8. DeAngelis, S (2013). “Additive Manufacturing and the Future of the Supply Chain. 11. Berman, J. (2016, May 20). UPS rolls out plan for full-scale on-demand 3D printing manufacturing network. Logistics Management. 15. DHL. (2016). 3D Printing and the Future of Supply Chains: A DHL perspective on the state of 3D printing and implications for logistics.